One of the big mysteries of astrophysics concerns the nature of dark matter. We have solid evidence that dark matter is real. You can read a 5-part series I wrote on just how we know it’s real. What we don’t know is just what dark matter is made of. The most common idea is that dark matter is some kind of weakly interacting massive particle (WIMP), that is not regular matter (electrons, protons, neutrons, etc.) but is somewhat similar. “Weakly interacting” in this case means that it doesn’t interact strongly with light, which would explain why it is basically invisible or “dark” matter. Other ideas such as tiny black holes or modified gravity simply don’t agree with what we observe (again, note the series above). So the race has been on to directly detect some kind of dark matter WIMPs. That is, some kind of low mass, chargeless particle that doesn’t interact strongly with light. So far we haven’t been successful. There is an alternative idea for dark matter that isn’t as popular, known as an axion. The axion is a hypothetical particle that was first proposed in 1977 to address certain issues in quantum chromodynamics (QCD), which describes the behavior of quarks and such that make up protons and electrons (among other things). I won’t try to go into the details of that here. What makes the axion interesting for dark matter is that if axions exist, the would be low mass, chargeless particles that don’t interact strongly with light. That seems like a perfect candidate for dark matter! So why isn’t the idea more popular? It has to do with two reasons. First, while axions are an interesting solution to the QCD problem, they aren’t the only possible solution. Second, if axions exist, they would be very different from other massive particles. All the known regular matter (electrons, quarks, protons, etc.) are fermions, but axions are bosons. This means that axion dark matter would behave differently than WIMP dark matter. WIMP dark matter describes what we observe rather well, so they are generally favored over axion dark matter. But axion dark matter hasn’t been ruled out as a possibility. Of course the proof either way will be to detect a dark matter particle directly. Now a new paper in Physical Review Letters (paywalled, but arxiv here) argues that there might be a simple way to detect axionic dark matter. The idea uses a relatively simple device known as a Josephson junction. You can see an image of one below. Basically, a Josephson junction consists of two superconducting materials separated by a thin layer of non-superconducting material. A superconductor is a material through which a current can flow without any resistance. Within a superconductor the electrons flowing through the material pair up (known as Cooper pairs). This pairing is an effect of quantum mechanics. If you have two superconductors separated by a thin layer of regular material, then the paired electrons can flow through the regular material at a constant rate, known as a supercurrent. 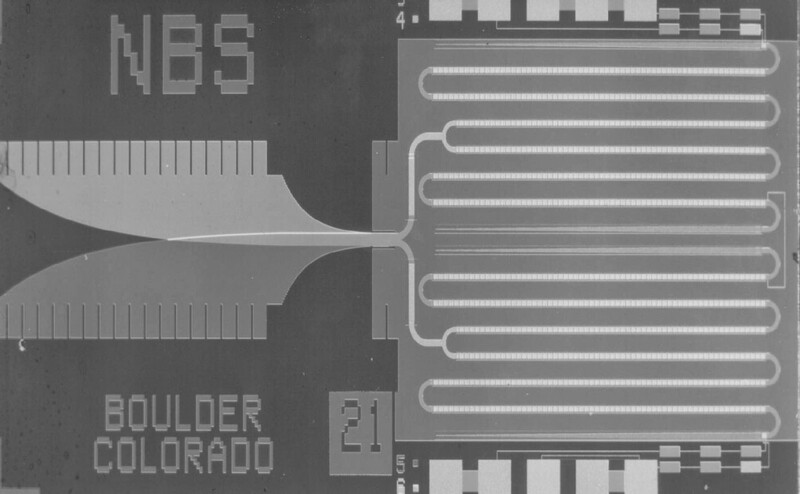 This supercurrent is very sensitive to changes in voltage, so Josephson junctions are used in devices to make extremely sensitive measurements of voltage and magnetic fields. If dark matter is made of axions (and that’s still a big if) then there should be lots of them flowing through the Earth all the time. Some of them would also interact with Josephson junctions, and that interaction should be observable as a fluctuation in the supercurrent. The hard part will be to make sure that the junctions are shielded from other interference, such as radio and microwave radiation, but that doesn’t seem to be an insurmountable problem.